I've been buying this brand nappy since my baby was born and I truly love them. They are soft and gentle on my babies skin, they don't have any plastic smells like normal shop nappies and i feel better using them than using other non biodegradable nappies. These are great nappies, lovely and soft and comfortable for baby and also really absorbent I have never had a leak with them! Absorbency wise I have found these as good as any regular supermarket nappies (better than most) and better than other Eco nappies. Also like that they do not smell of perfume, or cling to baby when wet. As mentioned by other reviewers, sizing is a bit small. I ordered these nappies instead of the Naty brand that I usually go for and I am very happy with them. 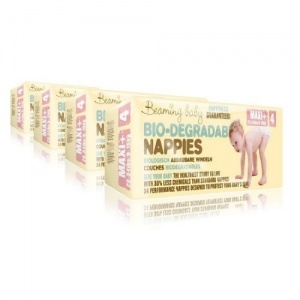 I still prefer the Naty brand as I feel the texture is a little less scrunchie and a bit softer against baby's skin but they keep him dry all night and are great value for a biodegradeable nappy. I also love shopping on this site because the communication is really brilliant, delivery times are really reliable and Siobhàn always leaves sweet little thank you notes on the invoices it feels good staying local and buying from an Irish website. Tried all the "bio" nappies with older child and indeed some of the regular ones and these beat them all hands down. Sturdy, compact, great fit, no leaks, no nappy rash, and the eco and health benefits on top! Excellent nappies, best Eco ones I've used. Love that they keep baby dry all night. Love these nappies. We've been using them for over two years and have never had any leaks or nappy rash. Highly recommend them. When I read about beaming baby I wasn't convinced at first but alone the fact that they are biodegradable made me try them. And I haven't looked back since. My lo rash has cleared up, the nappies don't leak and my conscience towards the environment isn't as heavy anymore! Winner all around and would recommend it to anyone!